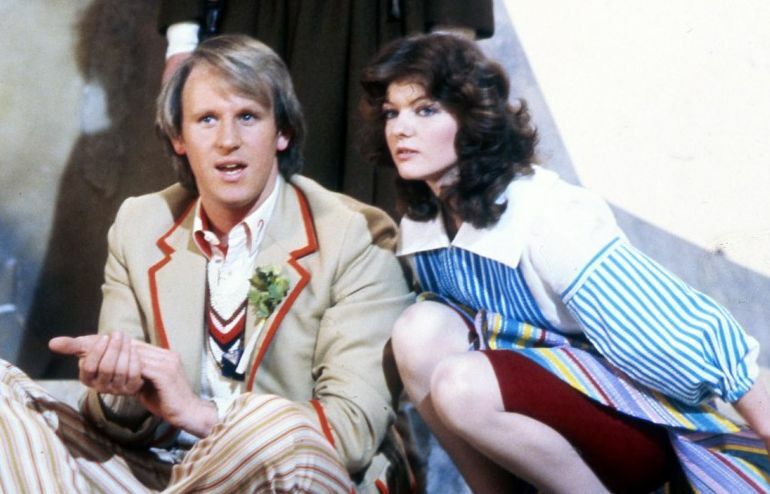 Although Kinda had somewhat bemused Doctor Who fandom in 1982, it was popular with both the general audience and the Doctor Who production team, so a sequel always seemed likely. Whilst Snakedance resembles a traditional Doctor Who story much more than Kinda did, it’s still quite unusual. Unless you count the Mara at the end of episode four, nobody dies and whilst the plot does develop in a linear way there’s still a considerable amount of time to debate the nature of evil. As with Kinda, Bailey’s Buddhist beliefs are very much to the fore. And like Kinda, Bailey would select the names of several characters from various languages. For example, Tanha is a Buddhist term that means “thirst” and Chela is derived from a Hindu word meaning “slave” or “servant”. Snakedance is also quite similar to Kinda in that whilst Janet Fielding does get the chance to shine, she’s also off-screen for quite some time (particularly in episode three). This gives a welcome chance for Sarah Sutton to enjoy more of the limelight. 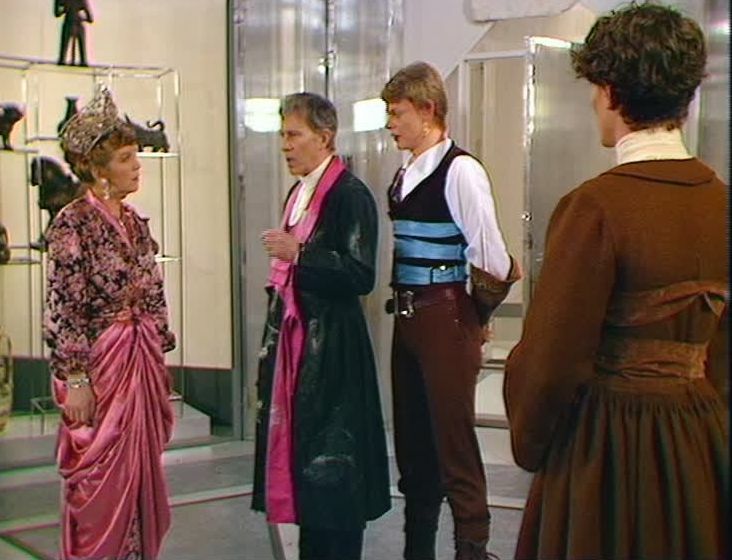 As with Arc of Infinity, Nyssa spends the majority of the story with the Doctor and there’s a very interesting, slightly bickering relationship, that develops. Nyssa was the most underwritten companion of S19 and it’s only a pity that finally she’s beginning to show more promise just when her days are numbered. Peter Davision is wonderful in this story. For me it’s one of his three best performances as the Doctor, along with Frontios and The Caves of Androzani. 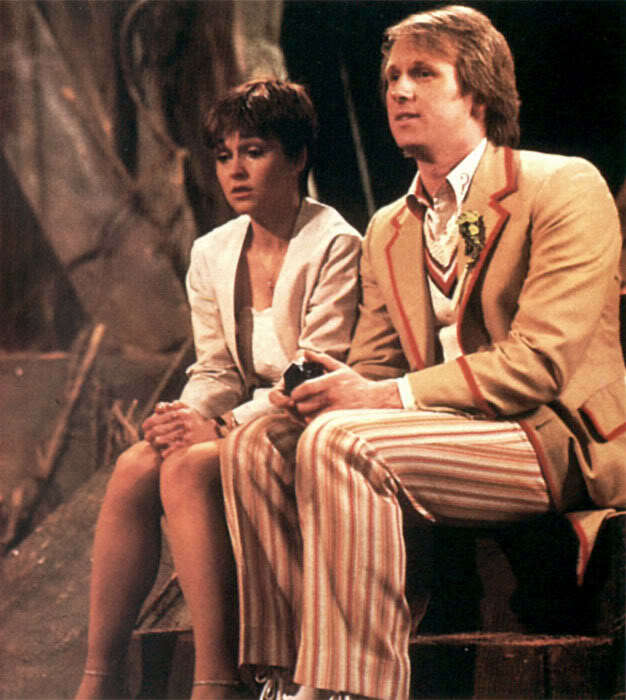 From the opening scene, he seems to have much more of a sense of urgency than in recent stories, as he pushes Tegan hard (too hard for Nyssa’s liking) to remember her dreams. Later, he spends much of episode three locked up, firstly by himself and later with Nyssa. And whilst some of the other Doctors would be pacing up and down and desperately trying to find a way out, there’s a lovely sense of calm about Davison in these scenes – he doesn’t seem to be doing much, but that’s the mark of a good actor. It’s also noteworthy that he spends most of the story unable to make people believe that he’s anything but a raving madman, since in most Doctor Who stories the Doctor tends to get welcomed into the fold fairly quickly (Kinda is a good example of this, whilst Frontier In Space is, like Snakedance, a relative rarity where we see the Doctor as an outsider for the majority of the yarn). AMBRIL: Now take this, for example. It dates from the middle Sumaran era and unusually is mentioned quite specifically in the Legend. Oh, there can be no doubt. The reference is to the Six Faces of Delusion. Now count. One, two, three, four, five. You will observe there are five faces, not six as the Legend would have it. Now, my point is this. I do find it quite extraordinarily difficult to take seriously a Legend that cannot even count accurately. Of course, artistically speaking, it’s an entirely different matter. The piece is exquisite. An undoubted masterpiece. AMBRIL: Certainly not. Whatever for? DOCTOR: Please. I want to show you something, then I’ll go and leave you in peace. DOCTOR: Now, count the faces again. AMBRIL: Do as he says. CHELA: One, two, three, four, five. DOCTOR: And one makes six. The sixth Face of Delusion is the wearer’s own. That was probably the idea, don’t you think? AMBRIL: Get out! Go on, get out! 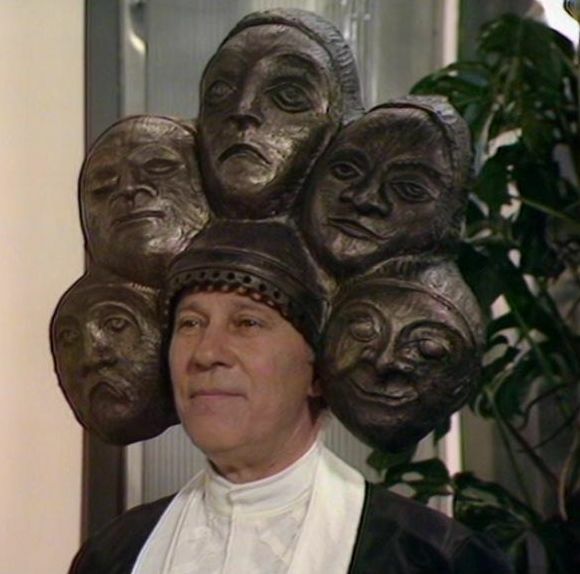 John Carson’s performance is beautifully judged and must rank as one of the best Doctor Who guest-star performances. There were plenty of bigger names that guest-starred in Doctor Who, but few were as good as Carson. He’s a major reason why this story works so well. The rest of the cast are equally good though. Snakedance has a fairly small group of characters, which helps to ensure that all of them have room for some decent scenes. Colette O’Neil is perfect as Tahna, the bored wife of the Federator, forced to listen to endless tedious speeches by Ambril about the history of Manussa. Although Martin Clunes’ performance does tend to crop up on “before they were famous” type series, he’s fine as Lon, the bored son of the Federator. Jonathon Morris gives a fresh-faced vigor to the role of Chela and Brian Miller (Mr Elisabeth Sladen) has a lovely turn as the showman, Dugdale. DOJJEN: No, look into my eyes. You have come this far. You must not now give in to fear. Look. DOCTOR: It’s the poison. The effect of the poison. DOJJEN: Fear is the only poison. DOCTOR: How, how can, I must save Tegan. It was my fault, so how, how can. Destroyed. How can the Mara? It was my fault. DOJJEN: Steady your mind. Attach to nothing. Let go of your fear. DOCTOR: What is the Snake Dance? DOJJEN: This is, here and now. The dance goes on. It is all the dance, everywhere and always. So, find the still point. Only then can the Mara be defeated. DOCTOR: The still point? The point of safety? A place in the chamber somewhere. Where? DOJJEN: No, the still point is within yourself, nowhere else. To destroy the Mara you must find the still point. This excerpt helps to highlight that Snakedance is something unusual. For those who prefer monsters and explosions it might seem a little tame, but I’d take this over the empty heroics of Earthshock any day. If one were being picky, then you could say that Manussa is not the most convincing of planets – it looks incredibly stagey (the entrance to the cave for example, is very artificial). In the end though, I don’t really think this matters, as it’s the script and characters that are important and not the visuals. It’s a great shame that Christopher Bailey never wrote for the series again, but at least we have Kinda and Snakedance. Not only two of the best Doctor Who stories of the 1980’s, but two of the best Doctor Who stories, period.